 The Boggle word game helps children learn new words.  Contains 16 letter cubes, cards, timer and tray.  Played by 2 to 8 people. The Boggle word game is a really fun game! It is played with lettered dice inside a tray that are shaken and used to form words. Boggle can teach children new words and improve children’s reading, spelling and even their grammar! We recommend it for kids that can already read and that have a more advanced vocabulary (for children ages 8 and up). In the Boggle board game, kids can improve their grammar. They can learn about plurals (you get double score if you add an “s” to a word). They also learn about the past tense and gerunds. For example, kids get extra points when they look for “tan” and “tanned” or “tanning”. Kids also learn about the structure of words and how some words are made of smaller words. The game can also encourages kids to use the dictionary in order to verify the validity of a word, if a word is being challenged by other kids. By the way, the Scrabble dictionary can also be used with Boggle and can help generate word ideas. 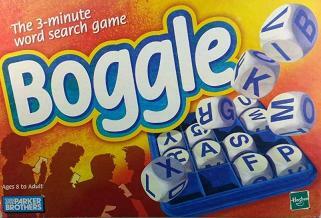 The Boggle board game can easily be played by 2 to 8 people. It comes with 16 letter cubes, cards, a timer and a plastic tray and it is played with a pen or pencil and paper. Players have to find as many words as they can using adjacent letters. The words have to be the longest possible (longer words earn more points) and be different from words that other players have found. Time is limited to 3-minute periods, good for kids with short attention spans. The Boggle board game is also a great travel game. It is compact, therefore it can be played in a car or a plane or at the hotel during the holidays. There are many versions of the Boggle available. We recommend the original Boggle word game and also Boggle Junior for younger children (ages 3-6). In Boggle Junior, kids link pictures to words and letters. The game contains oversized letter cubes (easier for children to handle) and colorful picture cards with the name of the object printed on the card. Kids have to spell the word out loud. Then they have to find the letter cubes that they use to spell the word using the plastic tray. As they improve, words can also be covered so that younger children spell out the word without looking at any letters on the card.